If your vehicle is equipped with a sunroof, you can slide or tilt your sunroof with the sunroof control lever located on the overhead console. The sunroof can only be opened, closed, or tilted when the ignition switch is in the ON position. • In cold and wet climates, the sunroof may not work properly due to freezing conditions. • After the vehicle is washed or in a rainstorm, be sure to wipe off any water that is on the sunroof before operating it. Do not continue to move the sunroof control lever after the sunroof is fully opened, closed, or tilted. Damage to the motor or system components could occur. 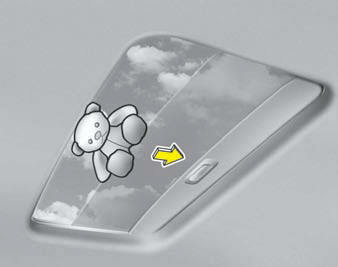 The sunroof cannot slide when it is in the tilt position nor can it be tilted while in an open or slide position. Never adjust the sunroof or sunshade while driving. This could result in loss of control and an accident that may cause death, serious injury, or property damage. To open or close the sunroof (manual slide feature), pull or push the sunroof control lever backward or forward to the first detent position. Pulling the control lever downward also closes the sunroof. To open the sunroof automatically: Pull the sunroof control lever backward to the second detent position and then release it. The sunroof will slide open automatically but will not open all the way. If you would like to completely open the sunroof, pull the lever once more. However, the second time the lever is pulled, the sunroof will open only while the lever is pulled. 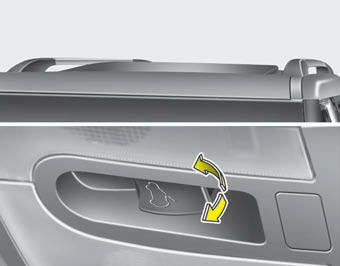 To stop the sunroof sliding at any point, pull or push the sunroof control lever momentarily. To close the sunroof automatically: Push the sunroof control lever forward to the second detent position and then release it. The sunroof will automatically close all the way. If an object or part of the body is detected while the sunroof is closing automatically, it will reverse the direction, and then stop. The auto reverse function does not work if a tiny obstacle is between the sliding glass and the sunroof sash. You should always check that all passengers and objects are away from the sunroof before closing it. 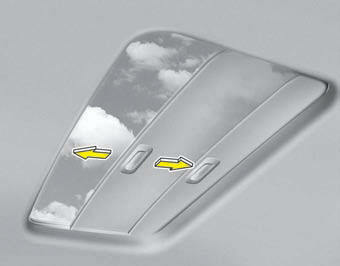 To open the sunroof (autotilt feature), push the sunroof control lever upward to the second detent. The sunroof will tilt all the way open. To stop the sunroof tilting at any point, operate the control lever. To close the sunroof, pull the sunroof lever downward until the sunroof moves to the desired position. • Be careful that no heads, hands and body parts are obstructing a closing sunroof. • Do not extend the face, neck, arms or body outside the sunroof while driving. • Make sure your hands and head are safely out of the way before closing a sunroof. • Periodically remove any dirt that may accumulate on the guide rail. • If you try to open the sunroof when the temperature is below freezing or when the sunroof is covered with snow or ice, the glass or the motor could be damaged. • The sunroof is made to slide together with the sunshade. Do not leave the sunshade closed while the sunroof is opened. The sunshade will automatically open with the glass panel when the glass panel is moved. Close it manually if you want it closed. Whenever the vehicle battery is disconnected or discharged, you must reset your sunroof system as follows: 1. Turn the ignition switch to the ON position. 2. According to the position of the sunroof, do the following. Push the sunroof control lever upward until the sunroof tilts completely upward. 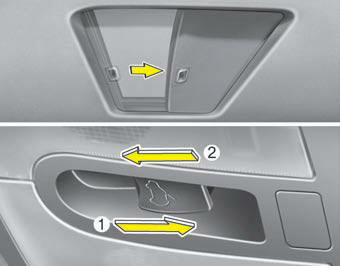 2) In case the sunroof is open: Push the sunroof control lever forward until the sunroof closes completely. 4. Push the sunroof control lever upward (for about 10 seconds) until the sunroof has returned to the original tilt position after it is raised a little higher than the maximum tilt position. Then, release the lever.